I wanna make it work. 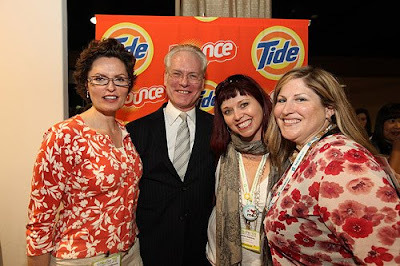 The catch phrase of Bravo TV's Project Runway star Tim Gunn, I was excited to meet the fashionisto (is that a word??) at BlogHer '09 and get a little nugget that would help me pull off a look and put my best foot forward. My encounter with Tim would be my first opportunity to check in with a fashion expert/celebrity, share my physical insecurities and learn a trick or tip to make it all better. Our 30 second chat would be the next best thing to him kissing my boo-boos, putting on a Band-Aid and sending me on my way. On second thought, I don't really think he'd be down with kissing my boo-boos, and I don't know that I would be okay with that, either. There we were, one-on-one, he signing a 8-by-10 glossy and me smiling and overly eager. Kate: Hi there, Tim. It's such a pleasure to meet you. I have a question for you - I'm a curvy lady, and I'm really searching for the right thing to make it work. Kate: Well, I love that you love curvy ladies (ed. note: I know he doesn't really "love" curvy ladies. I'm guessing he doesn't even really love bears). Kate: Maybe a wrap dress? Tim: Absolutely. You should stick to wrap dresses. You could totally make it work. After our brief chat, I thanked the man, shook his hand and posed for a photo with some of my Cincinnati blogging gal pals. It was one of my better brushes with fame. And at least this time I got some good advice. What a great memory to take away from the conference! I didn't get to meet him, but I think he's fantastic. So glad you got that chance. Also, sorry we never met up! So envious! 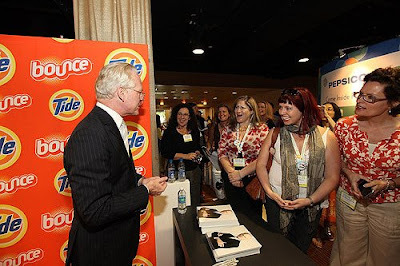 I would love to meet Tim Gunn, but I'm thrilled you did! On the topic of meeting folks, it was great to meet you on Fountain Square the other week. I still haven't sorted through the ton of photos I took that day. I'll let you know when and look forward to hanging out for more than a moment! It was a magical moment, wasn't it?